The Washington Wizards are another NBA team that’s going to be smaller and leaner in most of its lineups next season. Seems like Nene will be the big man that pays with minutes and his place in the lineup. It’s not quite certain he’s too happy about it. While a head coach can talk about doing what’s best for the team, a player like Nene, who has started in 601 of 747 career NBA games, might not look at the change and feel too happy about it, especially when it’s his contract year. He’s making $13 million this season, and despite his age and dropping production, he’s obviously hoping that the huge cap space bump will help him make big money on his next deal as well. The Wizards played a lot of minutes with both Marcin Gortat and Nene on the floor, but in the preseason we’ve seen mostly the Brazilian coming off the bench, which is the likely scenario for the regular season. 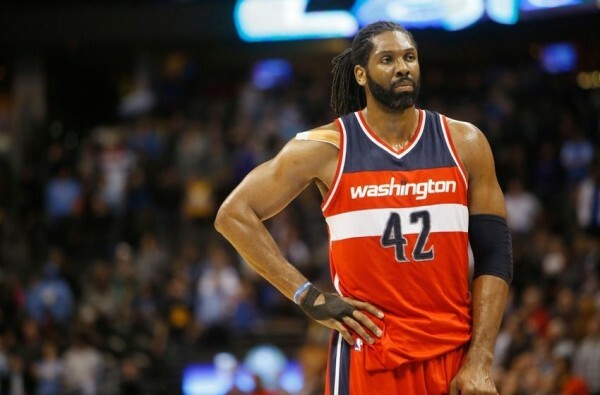 It might make Nene the best backup center in the league and further improve the upgraded second unit for the Wizards. His defense, passing and scoring should make him the focal point offensively for the bench unit in Washington. Nene averaged 11 points and 5.1 rebounds per game in 25.3 minutes a night. His minute output has been dropping for the last few years, and we’re likely going to see more of the same this season in his new role. Instead of him, we might see Jared Dudley getting more minutes as starting small forward with Otto Porter Jr. as the stretch ‘4’, although it does seem like Randy Wittman still isn’t completely sure of where to go with this new feature.